The Original Tile Tape is a front-mount, crystal clear, very strong adhesive film for making mosaics of stone, ceramic,glass and metal tiles. Easy to use, Tile Tape resists stretching or tearing and is designed to firmly hold tiles until installation after which it releases cleanly leaving no adhesive residue on tiles. 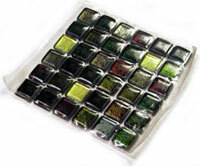 Meshmount was the first company to develop a tape exclusively for the mosaic and tile industry over 15 years ago and Tile Tape is still the premium mosaic tape in use for front mounting tiles of all types. 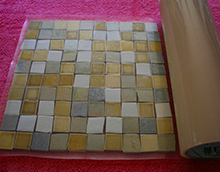 No heat gun or apparatus needed to apply Tile Tape thus saving energy and money. Excellent strength characteristics: Tile Tape is very hard to tear or stretch. Self-leveling: eliminates the different levels in the surface created by stone and tile pieces of differing thickness. It is crystal clear so installer can see the tile pattern while installing. The adhesive is water resistant so it will not lose adhesion while at the workplace due to accidental exposure to water. 100% adhesion of tile back to mortar. 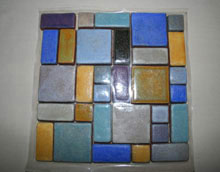 Aesthetically pleasing when it is on stone, ceramic or glass tiles. Ideal for pools and other wet applications where you want total tile contact with mortar; no backing between your material and the mortar. Wet strength paper for Back-Mount. Front-mount kraft paper with water-soluble adhesive.